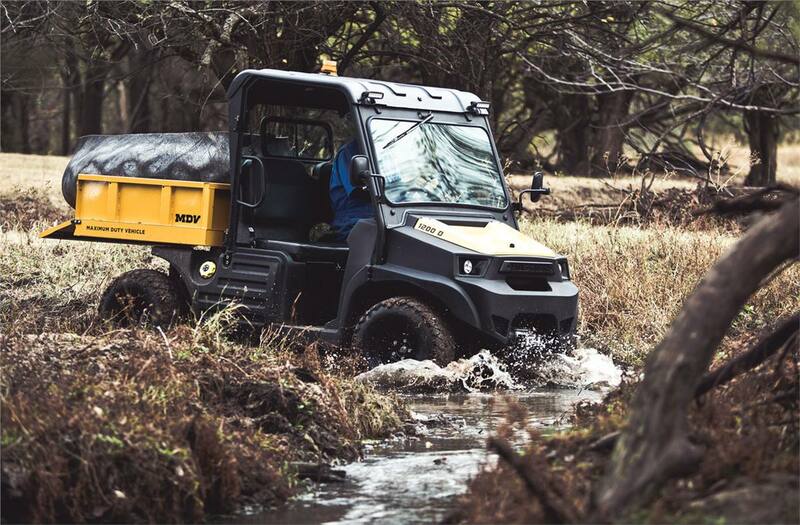 The “utility” from other utility vehicles comes only after you have the vehicle loaded. 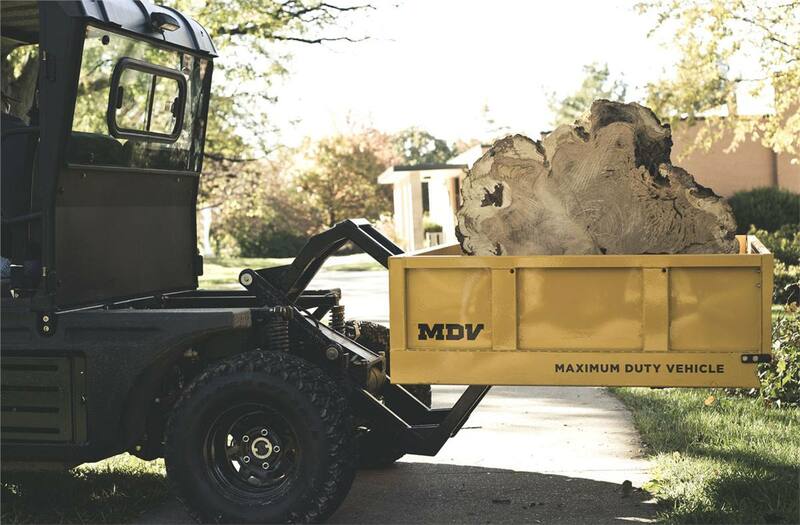 But with MDV’s optional LeveLift technology, you get “utility” the moment you arrive at the job site. 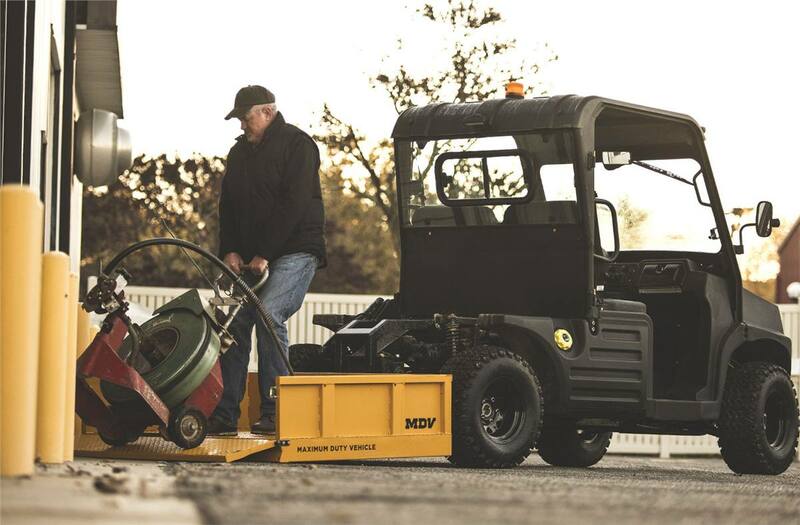 With a 750 lb lift capacity, LeveLift does the heavy lifting. Many loading and hauling jobs that used to require a crew of two or more can now be performed by just one person. LeveLift™ Bed Technology: Flip the switch and LeveLift™ brings the cargo box up, back and down, enabling you to load at ground level or at any point along the mechanism’s arc of motion. 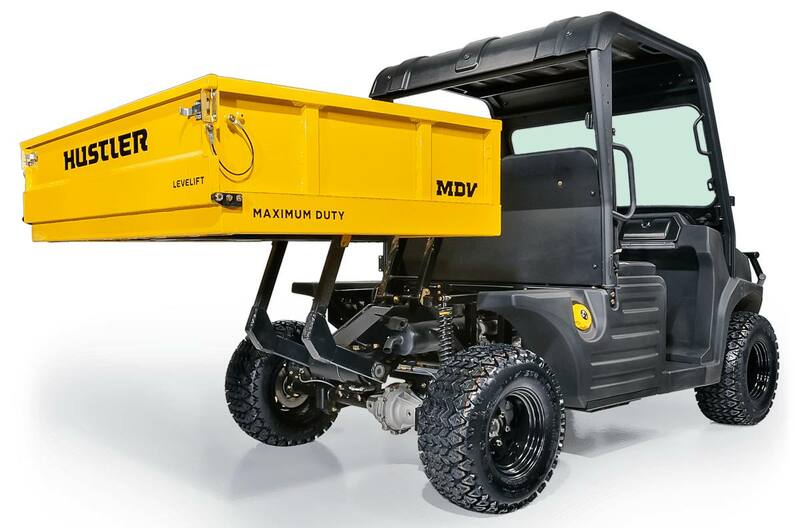 Spacious Cab: The MDV’s spacious cab is easy to get in and out of with heavy clothes, coats, etc. Fast Top Speed: Top speed of 37 mph. 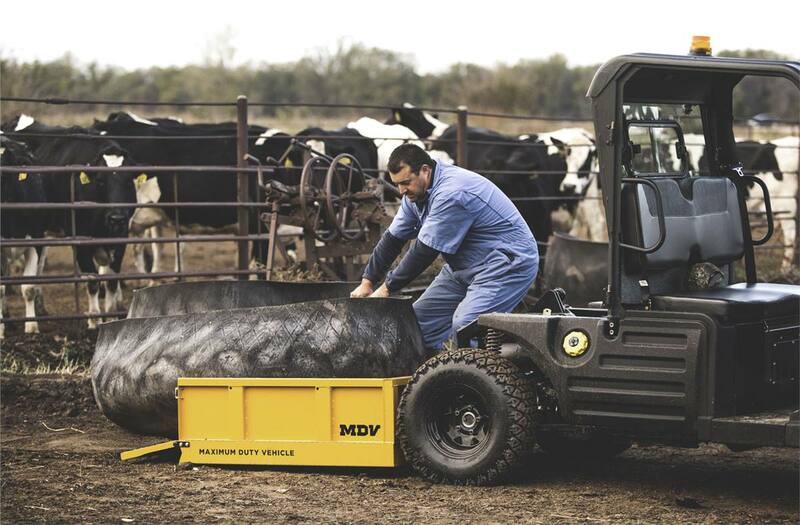 Floating Rear Axle: The MDV’s floating rear axle maintains a constant ground clearance even at maximum load. Tire Size Front: 350 Mag 25 in. x 10 in. - 12 in. Tire Size Rear: 350 Mag 25 in. x 10 in. - 12 in. Cargo Box Capacity: 750 lb. Cargo Bed Dimensions: 45.9 in. x 58.2 in. x 11.5 in. Turning Radius: 15 ft. 9 in. Offering a one-year limited warranty. 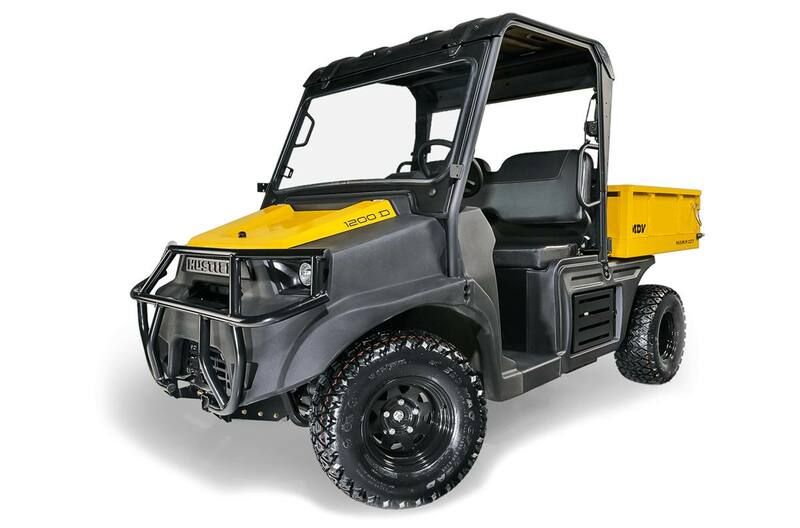 Hustler® side-by-sides are built to the highest of standards, but our warranty will provide extra peace of mind. See your local Hustler dealer for complete details. Roof: Provides year-round weather protection to operator and passenger. Front Windshield: Blocks wind, dust and other weather elements. Rear View Mirror: Expands operator visibility. Hitch/Winch Mount (Front): Attaches to front of frame. Two inch receiver allows for attachment of other accessories and implements. Hitch Mount (Rear): Mounts to back of frame. Allows for attachment of trailer to pull heavy loads. MDV LeveLift model only. Brush Guard: Protects the front of the vehicle. Work Lights: Provides a wide range of light (ideal for tasks at night). Wipers: Helps resist rain, snow and ice buildup on windshield. Flashing Beacon: Provides excellent visibility for vehicle bystanders. 5' Steel Snow Blade: Removes snow and ice easily from outdoor surfaces. Side Mirrors: Offers operator expanded visibility. Doors: Provide comfort in inclement weather. 440 Mag 25 in. x 10 in. - 12 in. : More aggressive tire for extreme conditions. Aluminum Wheels: Presents a more polished appearance to vehicle.